PS Doh! I've just discovered that Locked In A Room (and the missing Alone Am I) is not by our Scottish Poets but actually by a similarly named Irish band! But I'm going to leave it as it is 'cause it's a good track anyway. I was just about to tell you that...about those other Poets then I read on. When I lived in Edinburgh I actually got to meet George Gallacher, the original vocalist and a couple of the other guys. That happened when me and my dear friend Lenny of the Thanes)went to Glasgow to meet them. it...)There you will also find some rough but really cool demos from before the band had any records out. I know it's been posted in blogland but serious fans would want to track it down. Thanks for that, Aldo. 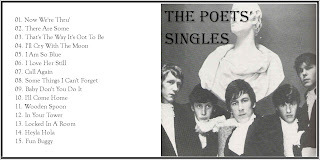 I followed the Tapestry Of Delights discography which lists the Pye single as by our Poets but then read the sleeve notes to Psychedelic Pstones which puts the record straight. I'm still trying to track down the Scotland's No 1 Group CD - gotta hear those demos! And of course if any of The Poets object to my posting their music, I'll take it down. RIP George Gallacher, an inspirational gentleman.